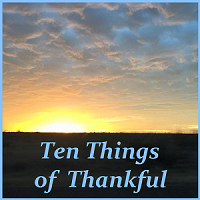 Welcome to Ten Things of Thankful! We gather here each weekend to share our posts about the things we are thankful for in our lives, and sometimes just to report that we've survived a difficult week; when we start focusing on the positives and the silver linings, we are able see that life is good. We also encourage each other by sharing pieces of our own journey. The people who participate in TToT are a truly awesome bunch from all age groups and all walks of life; I hope you'll join us and invite your blog friends to do the same, everyone is welcome! This week's TToT link-up will open shortly after midnight (Central Time) on Thursday night, and will remain open until Tuesday night, so you have plenty of time to work on your post. Please visit as many of the links as possible, sharing your thoughts is what this group is all about; and PLEASE check back next week for new links that were added later, those folks will appreciate your comments too! Thank you for your part in making Ten Things of Thankful such a wonderful experience!